Liquid supplement formulas are often more convenient for many patients, are easier to swallow, and may be more efficiently absorbed. Cal/Mag Liquid is a balanced blend of several micronutrients known to be important for supporting the development and maintenance of bone throughout the lifespan. Calcium citrate/malate has demonstrated superior absorption to other forms in virtually all comparative studies. Magnesium intake is low in several high-risk groups, and supplementation helps to optimize parathyroid hormone levels and bone turnover rate. Vitamin K is becoming newly appreciated for its role in supporting production of vital bone matrix proteins, and the trace minerals zinc, copper, and manganese all play important biochemical roles in the production of bone matrix tissue. 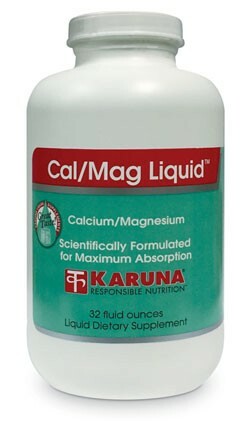 No other bone health product is as complete and easy to take as Cal/Mag Liquid. Suggested use for adults: Two tablespoons daily taken with meals, or as directed.